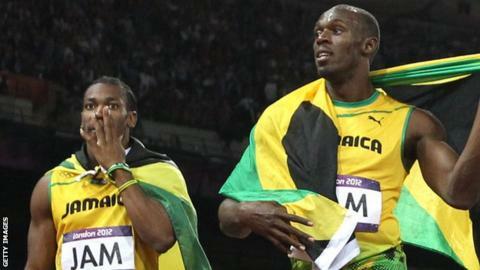 Olympic champions Usain Bolt and Yohan Blake opened their 2013 seasons by taking part in 400m races in Jamaica. Both were competing for the Racers Track Club at the Camperdown Classic outdoor meeting at the National Stadium in Kingston. Bolt overtook Allodin Fothergill in the finishing straight to win his heat in a time of 46.74 seconds - way off Michael Johnson's world record of 43.18secs. Blake was second in his heat in 46.64, behind training partner Warren Weir. Weir's was the fastest time of the night - 46.23 seconds. There was no final for the event, which was part of a meeting that attracted around 30 athletes. "I felt a bit nervous," said 100m and 200m world record-holder Bolt. "I just came out here to win and I'm glad I won injury free." Blake said: "I'm happy with the run, despite the time. I'm just looking forward to the rest of the season."